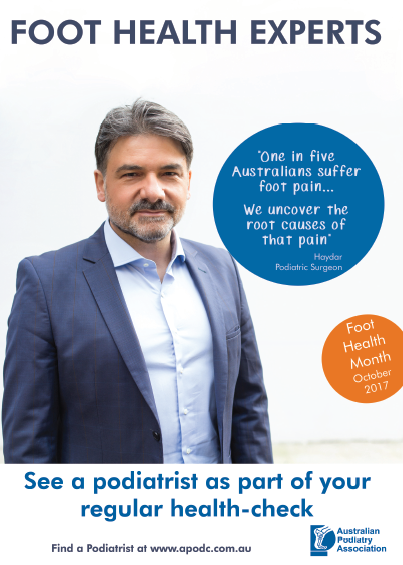 The Australia Podiatry Association has again launched its annual Foot Health Month campaign this October – Foot Health Experts. This aims to educate people on the importance of good foot health and raise awareness on the benefits of seeing a Podiatrist regularly, as part of their annual health check. A podiatrist is an Allied Health Professional who are experts in foot and lower limb care. Podiatrists can assess, diagnosis and treat issues of the foot, ankle and lower limb to allow people to continue living healthy, active and pain-free lives. Podiatry is more than purely just the foot. Podiatrists are vital in keeping people moving, especially with our ageing population and the increase in people diagnosed with diabetes. No referral is required to see a podiatrist and most health funds allow on-the-spot claiming. If you find yourself with ongoing foot pain or difficulty caring for your feet, please be in touch with Swan Podiatry and Orthotics to arrange an appointment.